If you spend your workdays stuffed into a dollhouse-sized work space, these narrow desk converters are for you. 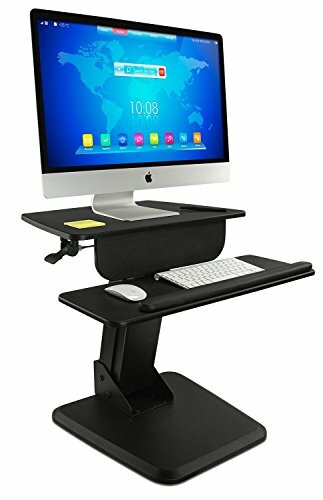 These standing desk converters have small footprints and sit on top of your existing desk (which should please your office manager 🙂 ) and they look good in a professional work environment. Look at that tiny footprint! The Ergotron WorkFit-S Dual with Worksurface+ is narrow, with a small footprint, yet it can hold two monitors. 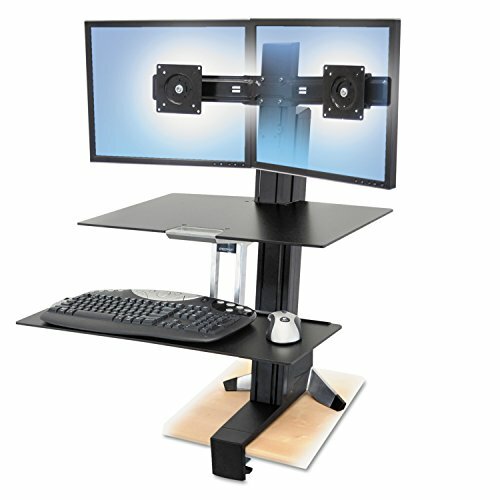 It’s easy to switch between sitting and standing heights, and moving it to a new workstation is as easy as unclamping it (without any tools needed). The Worksurface+ has, well, an additonal work surface right below the monitor mounts for books, notepads, etc. Pros: It’s height-adjustable, so you can use it sitting or standing and adjust its height with ease (no tools required). It clamps onto your current desk, so you can keep your existing furniture and move it to an entirely new location without having to reorganize your entire office layout. The dual monitor mounting system means you don’t have to sacrifice your dual monitor setup. Also great: the platform directly under the monitors can be used to hold things like coffee, notepads, and office toys. Cons: The keyboard platform sticks out into your “sitting space”, so be sure you still have enough space to sit comfortably in your chair once the keyboard platform’s depth of about 8″ is accounted for. 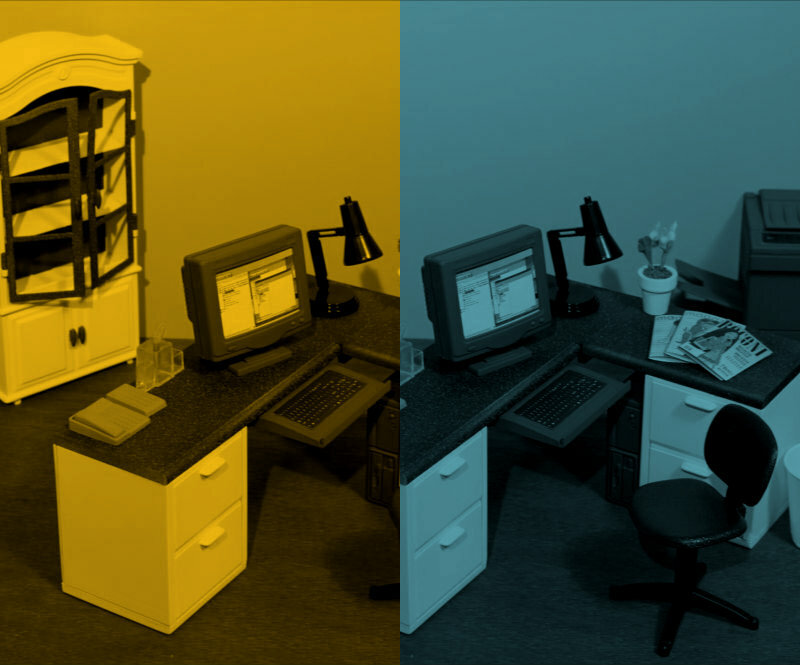 While the Ergotron itself is suitable for a small cubicle or work area, it does dominate the space you give it. You won’t be able to use the desk underneath it for anything. If you don’t have two monitors or just don’t want to (or can’t) mount your screens, check out the Mount-It! Sit Stand Workstation instead. Like the Ergotron, it’s got a small footprint and separate monitor and keyboard platforms, which will suit taller users. Pros: Nice, hefty design that is easy to set up (no clamping, no tools needed) and move with you when you change teams or projects. The assisted lift mechanism helps you convert it between sitting and standing configurations in seconds and doesn’t require any tools. The keyboard platform is large enough for both a keyboard and a mouse, and there’s a cable management system in the back to keep things tidy. Cons: The desk space underneath this thing is pretty much a loss: the platform is flat, so you can at least set your coffee on it, but it’s awkward for a notebook and only suitable for small objects. It’s only got enough space for one (huge) monitor. It might lack the pizzazz of adjustable standing desk solutions, but the Stand Steady Standing Desk is a popular pick because it’s budget-friendly and takes up very little space. You can use the space underneath it, making it a great standing desk solution for small desks. Pros: You can use the space underneath! I think that’s supposed to be a printer in the stock photo, but I could see this space being useful for laptop docks, phones, and notebooks. 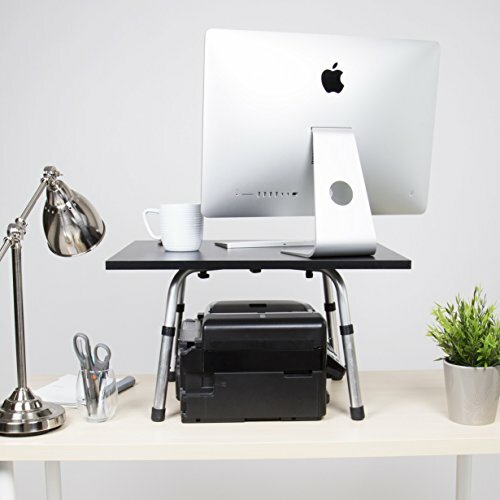 The Stand Steady’s biggest advantage over the competition is its low price – it’s considerably less expensive (to the tune of several hundred dollars) than most other space-saving standing desk converters. Like other standing desk “add ons” for small spaces, the Stand Steady is easy to take down and move to a new location in your office. Cons: The Stand Steady doesn’t switch between sitting and standing modes like more expensive standing desk converters. 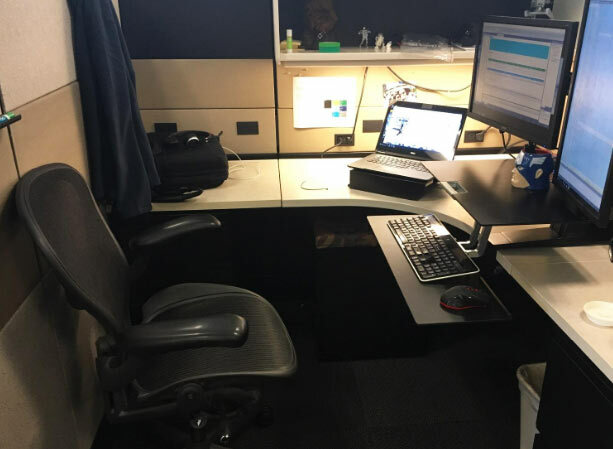 To sit, you’ll either need a standing desk height chair or you’ll need to move your keyboard, mouse, and monitor every time you want to switch. (Or if you’ve got a laptop, keep it on the desk and use its keyboard and screen when you sit.) Since this desk is designed to suit small spaces, it’s not really wide enough for two monitors. They make a wider version of the Stand Steady, though, so if you need two monitors and have the space to accommodate a 32″ wide table, check it out. Also, since the monitors just sit on the surface of the Stand Steady, taller users may find them too low for all-day use. 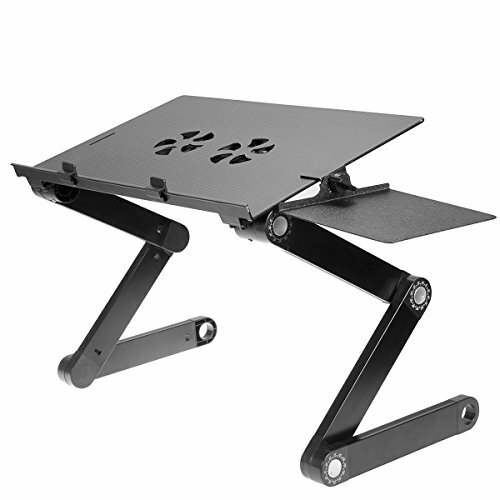 The iCraze adjustable laptop stand is about as little as you can get when it comes to space-saving standing desk solutions. If you (or your employees) are primarily laptop-based, then this small laptop stand might be all that’s really needed to get standing. Cons: It’s just for laptops – no peripherals besides a mouse will fit. Tall users are likely going to find the monitor rather low and possibly uncomfortable for all-day use in the standing configuration. There you have it: four great standing desk converters suitable for small desks, tiny tables, and compact offices.